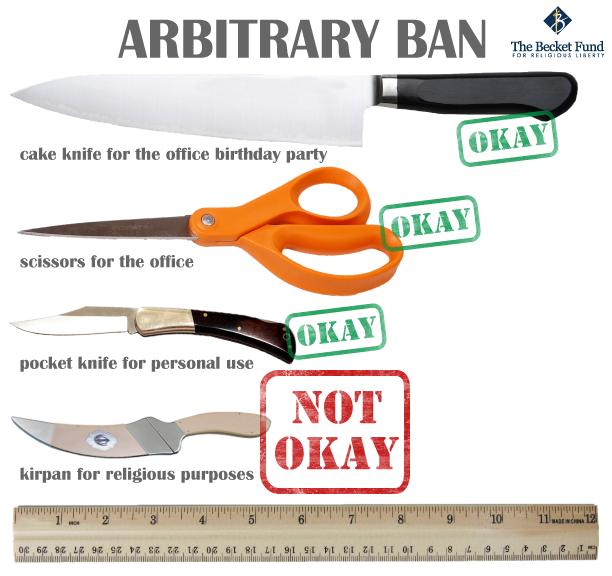 Washington, DC – In a settlement announced today, the U.S. Government completed its long retreat from discriminating against an American Sikh woman’s right to carry one of the five symbols of her faith–her kirpan, which is a ceremonial blade that’s duller and shorter than a butter knife (see infographic below). 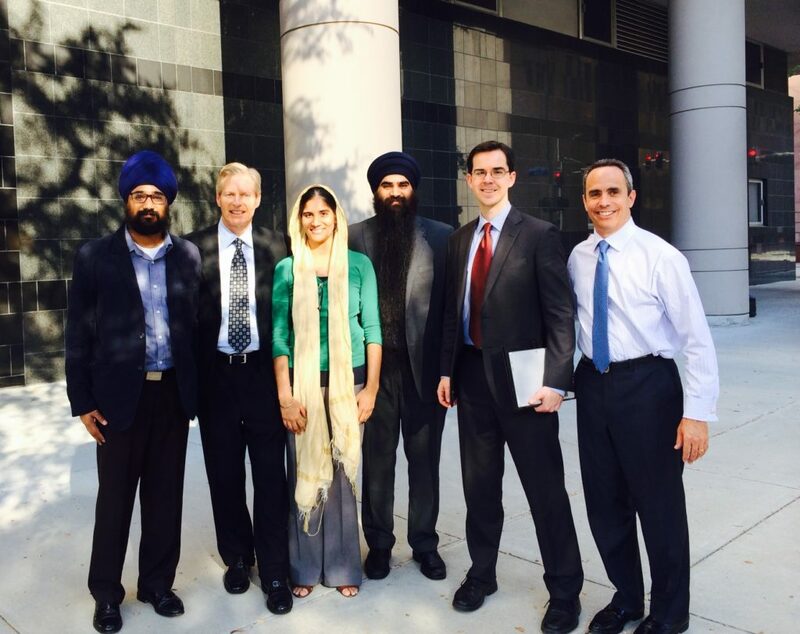 The settlement comes after the federal government—in response to the Sikh woman’s lawsuit—issued a groundbreaking policy allowing Sikhs and other religious minorities to wear religious symbols and attire in federal buildings. Ms. Tagore was fired from her accountant position with the IRS, banned from accessing federal buildings, and blackballed from future federal employment simply because her ceremonial kirpan had a 3-inch blade (learn more about kirpans here). Yet the federal government freely allows the public to access those same buildings with sharp 2.5-inch blade knives, metal canes, and other potentially dangerous items, and lets federal employees use far longer and sharper cake knives, box cutters, and other similar items inside the buildings. After being fired, Ms. Tagore sought protection under the Religious Freedom Restoration Act, and won a significant victory at the U.S. Court of Appeals for the Fifth Circuit. Her efforts forced the federal government to scrap its rigid kirpan ban and give Ms. Tagore a clean employment record and renewed access to federal buildings. The government agreed to settle the case shortly after the start of Ms. Tagore’s trial. Ms. Tagore was represented by Scott Newar of Newar Law Firm and Eric Rassbach, Lori Windham, and Daniel Blomberg with Becket. Mr. Newar was lead counsel on the case, guiding Ms. Tagore through five years of litigation and spearheading both the victory at the Fifth Circuit and the favorable settlement. The Sikh Coalition also represented Ms. Tagore for part of the case. This is Becket’s fifth victory in a row against the federal government: Becket clients have prevailed in the Hosanna-Tabor, Little Sisters of the Poor, Hobby Lobby, and Wheaton College cases. In the pending Holt v. Hobbs case, the federal government sided with Becket’s client.